When I went to my LHS looking for something other than my Blade 400 to fly, I was introduced to this “stepping stone” helicopter by Heli-Max. It was a joy to fly and a nightmare to fix when you crashed. I also had the idea that I had had a ‘ bad one’ and bought a second one as a ‘backup’. It was a fun helicopter to fly while I was trying to learn this whole CCPM flying. It flew really well in the backyard but was a bit ’ballooning’ in the wind ( most likely due to the size and tall profile). 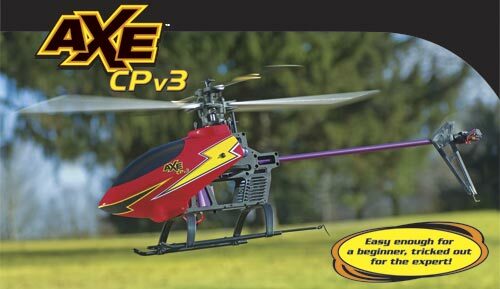 The box and the website both stated (as you can see from the official pic from Heli-Max’s website) that it was docile enough for a beginner and yet 3D capable for the expert. At the time I was definitely a beginner. For sport flying this bird really performs well until you crash it. Its engineering is a bit different than most. The swashplate moves downward when throttling up, which is a bit odd, but original. This heli is one that uses a motor to drive the tail so the tail, while holding reasonably well, doesn’t hold nearly as well as a belt driven or torque tube. Parts for this thing are way more expensive than parts for other helicopters near it class. The hop-up parts I thought were really overpriced but that is just my opinion and I bought them anyway just to see what it would give me. I did find out that the balls on the swashplate were prone to breaking in a crash so if you do get one of these it would probably behoove you to spring for the all CNC swashplate. I mentioned before that the Axe CP v3 was great to fly until you crashed it, and that is absolutely true. Now maybe I just really never had the skills to work on it like I do now but I could never get either one of the ones that I had to fly right after a serious crash. They would do ‘weird’ things sort of randomly. They would also just be a bit more unstable in one axis or the other after encounter with the ground. It was like once you crashed one of these there was a demon on board that refused to be exorcised. I wound up selling one and the other as parts just to get rid of the headache. At the time this was the only 300 sized collective-pitch game in town. Now with the Blade SR available I couldn’t in all good conscious recommend this heli as a stepping stone any longer. All three LHS in my area have basically stopped carrying this heli over the last year. Most likely due to some of the frustrations in this design. The helicopter is a complete RTF package. Just charge and go I really liked that it came with a DVD to watch and training gear!!! After flying the Axe I felt that it was a bit overpriced (my LHS had them for around 210 when I got mine, They are much more reasonably priced now) but I really did enjoy it when it was flying well. At the lower price you might consider the Axe to be an OK buy and it can be a good addition to your fleet. I just wouldn’t make it my ‘transition helicopter’ into CCPM flight. I would wait until I was fairly decent at sport flying with other collective pitch helicopters before trying this one. Also be ready with your pocket book as the parts for this are not super cheap. You can currently snag the HeliMax Axe 100 CP on Amazon for around $80.